REDDING, Calif. - During a 14-day backpacking excursion along Northern California’s Lost Coast, Simpson University outdoor leadership students dedicated a day to cleaning state park trails and campsites. 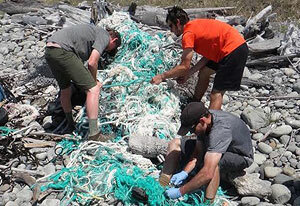 For the third year in a row, students partnered with the U.S. Bureau of Land Management to clear marine debris off the northern coast. More than 250 pounds of stinging nettle, overgrown blackberry briar, and debris was collected and carried to a central point for removal, according to a writeup on a BLM social media site. “We’ve been building quality relationships with these agencies, and Simpson’s outdoor leadership program now has an excellent reputation for its high environmental ethic and deep appreciation for the land,” said Dr. Paul Stonehouse, associate professor of outdoor leadership. Stonehouse took 11 students on the trip: Karissa Scheuermann, Alyssa Muro, Aixa Correa, Rhoda Boetteher, Ryan Maclean, Daniel Davenport, Shane Wachlin, Rich Bailey, Matthew Tsarnas, Kirsten Raridon, and Tony Moore. The group backpacked from the Mattole River to where Usal Road meets Highway 1, returning on May 13. For more information on Simpson University’s outdoor leadership program, visit simpsonu.edu/outdoorleadership. Clockwise from left, Ryan Maclean, Tony Moore, and Daniel Davenport clear debris from the coast.